We received a request from a blogger and marathon runner to take a look at his stroke. He was a Big Ten athlete (Go Big Ten!) at the same time we were, only his focus was on land while ours was in the pool. He’s had a lot of success running, even qualifying for the Marathon Olympic Running Trials twice! 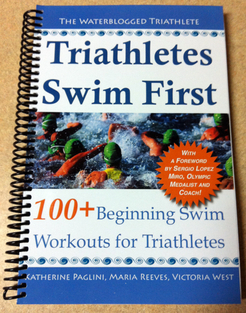 Now, he’s ready to make the transition to triathlons – so, we’re going to help him get more comfortable in the water. We predict that when he gets his swimming down, he’ll be a triple threat. 1. Your recovery is not symmetrical and your right hand is much higher than your elbow. While this isn’t the end of the world, you can correct this by practicing drills like 3 count pause drill, fingertip drag or zipper drill. We have descriptions of those drills in a previous post. You also want to work on your rotation. If you rotate more, it will be easier to get a high elbow recovery and keep your hands a little closer to your body during the recovery. Remember that each stroke goes fingers > wrists> elbows both above and below (catch & recovery) and that your pull should accelerate past the hip. Your strokes are also a little too short because you aren’t finishing your pull all the way past your hips, which makes you lose steam and let go of the water just prior to exiting the water for recovery. It’s important to finish the pull because that’s where a lot of the power in the stroke comes from. A good drill to correct this is armpit drill, tracing your thumb all the way from your hips up to the armpit to emphasize a good finish and a good recovery. 2. Your left hand is crossing over as it enters the water and then pulls too wide upon entry. Part of the issue is that you appear to enter the water with your hand tilted toward your thumb. When you enter the water this way, it is natural to pull outward instead of under the body. Try to adjust your entry so that your hand is tilted slightly toward your pinky. It is important for you to fix this so you don’t injure your shoulders. Check out our post on hand entry & exit with paddles as a tool. You’ll learn how to set up the paddles without wrist straps, which will make them fly off when you aren’t following through the catch. Below, we can see what crossing over looks like underwater. From this view it is easy to see that your stroke would be longer in length if you weren’t crossing over. Some coaches tell their athletes to “swim bigger” than they are by trying to lengthen their strokes. To enter wider, try drilling catch up freestyle with a kick board. We want you to try holding the kick board on the outside edge with one hand at a time. Have your recovering hand to grab the outside edge of the board before allowing the opposite hand to release the board and begin pulling. Once that hand is done recovering, grab the outside edge of the board and repeat the process with your other arm. You can also try swimming catch up freestyle with a quarter inch PVC pipe cut to about 8″ – 10″ in length. We will try to get photos up to better explain catch up with a board or pvc pipe soon. 3. You pull too wide with your left hand. You would have a more efficient pull if your elbow were bent and your hand were below your body instead of outside it. I would encourage you to try and keep an eye on your hands while your pulling. If your hands are in the right place, your elbow should be in the right place too. We suggest that you do some right arm only and left arm only freestyle to isolate each arm and work on symmetry with or without fins (depending on how it feels). Have the arm you aren’t using glued to the side. Breathe toward the right, then the left and repeat with the opposite arm. Then practice the same breathing pattern with a full stroke while maintaining that balance. 4. You have really nice head position during the breath! Seriously, the breath is great. 5. At times, you appear to be swimming “Catch Up” Freestyle. Your right arm almost fully catches up to the left arm. You should start your underwater pull with the left arm a little sooner. We think you’ll benefit from practicing a 3/4 Catch Up freestyle, where you conscientiously force yourself to start pulling when the recovering arm is 3/4 of the way through with the recovery. We didn’t have enough footage to verify if you were doing this during every stroke cycle. 6. It was difficult to see with limited video, but occasionally your head would drop too low – to the point where it was almost fully submerged underwater. We *think* (didn’t have enough footage) that we saw some side scrunching, which contributed to his head movement. We could not tell if it only happened after breathing or if it was a regular part of your stroke with the video you provided. When you breathe to the left, your left knee bends and goes out too far, and your left side scrunches a bit. It could also be that you need to practice a 4 beat kick (2 kicks per side) or a 6 beat kick (3 kicks per side). Some triathletes who swim long distances use a 2 beat kick (one kick per side), but it really depends on what feels most comfortable for the swimmer. For now, try to keep your legs from kicking out to the side. We encourage triathletes to incorporate kicking at practice because it will help overall fitness and a kick is a easy to drop on race day. Thanks for sending us your video! Please let us know if you have any questions about our drill ideas or suggestions. We encourage you to work on your stroke and send us a follow up video in a month. It would probably be a good idea for you to hire a coach for a few private lessons or consider joining a masters team. We will be adding many more swimming drills to our site as we go along. Do any of you have a drill you’d like to request? ‹ I Suspect I Might Hit A Plateau At Some Point In The Near Future… Any Advice? I love reading your blog, always getting some useful & needed tips. Thank you!!! That means so much coming from you! I was just telling my hubby about you and how you have been giving a voice to distonia and how good I imagine it feels when you swim. I want to post some good drills for you and am so glad we can help (however limited) I wish you the best over Thanksgiving!! !